Here's the buzz: TURN THIS BOOK INTO A BEEHIVE! is the bee's knees! Eagle Harbor Book Company hosted a fun event for Lynn last Friday. I went, bought my very own copy of TURN THIS BOOK INTO A BEEHIVE!, and had it autographed! This book is fascinating--and super cool! Kids can do experiments and activities while learning about bees. 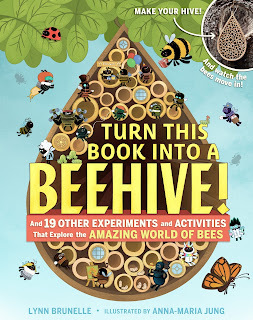 They can even turn parts of the book into a real beehive, encouraging mason bees to move in and pollinate! Yay! That's a huge deal to anyone who likes food. (Yeah, that's all of us.) Pollination leads to the food we eat, whether it's fruit, veggies, grains, or even cheese or meat from grazing animals. Bee populations are dwindling, and mason bees--the bees these hives attract--pollinate way more than honeybees. (Note: mason bees aren't aggressive, and they don't sting!) Helping the bees means helping everyone, so creating more hives is kind of saving the world, right? This book would be awesome for teachers, parents, or grandparents. Kids of all ages would enjoy it! Lynn is a fabulous writer. She earned four Emmy Awards writing for Bill Nye the Science Guy. Plus she's sooo nice, and she's a friend. Bloggy friends, it's time for a book chat! Have some tea and cookies while I tell you about three recent reads that I recommend! HOUR OF THE BEES by Lindsay Eager is middle-grade awesomeness. The writing is beautiful, and the story is incredibly moving. Something extra wow-worthy? This is Lindsay Eager's first novel! While her friends are spending their summers having pool parties and sleepovers, twelve-year-old Carolina--Carol--is spending hers in the middle of the New Mexico desert, helping her parents move the grandfather she's never met into a home for people with dementia. At first, Carol avoids prickly Grandpa Serge. But as the summer wears on and the heat bears down, Carol finds herself drawn to him, fascinated by the crazy stories he tells her about a healing tree, a green-glass lake, and the bees that will bring back the rain and end a hundred years of drought. As the thin line between magic and reality starts to blur, Carol must decide for herself what is possible--and what it means to be true to her roots. Readers who dream that there's something more out there will be enchanted by this captivating novel of family, renewal, and discovering the wonder of the world. 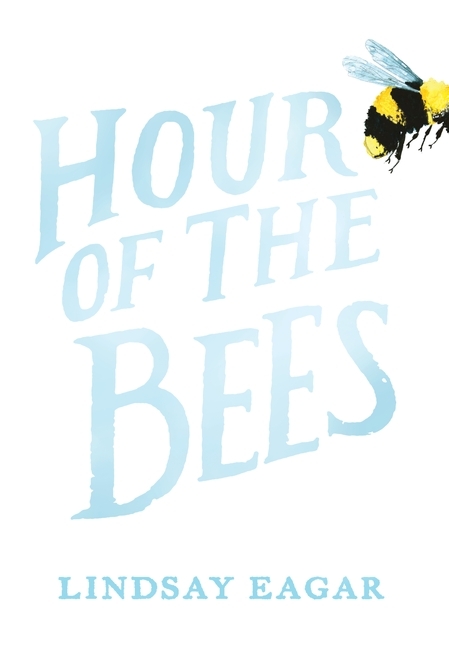 The characters in HOUR OF THE BEES are wonderfully imperfect and three-dimensional, and they all come together the way family members can in real life: at times flowing together smoothly, and at other times bumping and poking as they move. The setting is written so well it's inspiring, and Grandpa Serge's storytelling is poetic. Carolina's concerns and thoughts about school and friends feel legitimate and well-captured. I picked up this book while searching for comp titles for my middle-grade novel, PERFECT VISION. My novel has a protagonist whose grandmother has Alzheimer's, and it also has magic. (Most of my stories seem to have a bit of magic!) I wanted to see if HOUR OF THE BEES and PERFECT VISION have much in common. HELLO, UNIVERSE (or "Hello, Newbery"--Hee-hee!) by Erin Entrada Kelly is another middle-grade novel I highly recommend. Virgil Salinas is shy and misunderstood. Valencia Somerset is clever and stubborn. Kaori Tanaka tells fortunes and reads the stars. Chet "the Bull" Bullens is the biggest bully in the neighborhood. They aren't friends. They don't all go to the same school. But when Chet pulls an unthinkable prank on Virgil and Virgil's pet guinea pig, Gulliver, the lives of these four middle schoolers collide in surprising and unexpected ways. HELLO, UNIVERSE is a fun and truly lovely story that touches on differences, bravery, and friendship. It is told through multiple points of view, and I think the story is richer because of this. The characters are delightful. Virgil's grandmother--his Lola--is one of my favorite characters in the book. (And did you know I adore guinea pigs? My daughter used to show them in 4-H!) I loved reading this story as an adult, and I'm 100% certain I would have loved reading this as a kid, too. 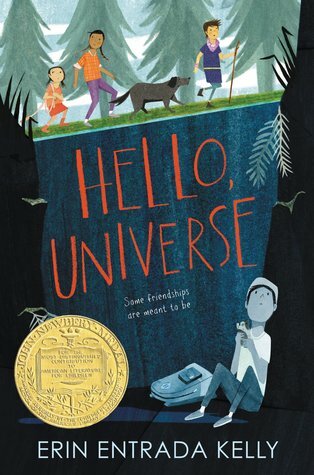 I chose to read HELLO, UNIVERSE because it won the Newbery. The way I would describe what I write is "humor with heart"--and it's often what I like to read as well. HELLO, UNIVERSE is funny, and it has oodles of heart, so I thoroughly enjoyed it. 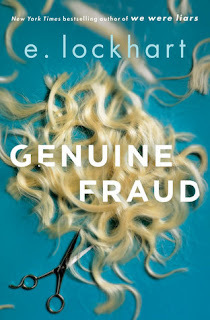 GENUINE FRAUD by E. Lockhart is a young-adult novel that's completely different from the other two titles I shared. I hate spoilers, so I don't want to say too much. This book is a page-turner--intriguing, expertly plotted, and so very unique. The characters are well-written, and you'll most likely want to discuss it with someone else who has read it as soon as you finish the book! The reason I bought GENUINE FRAUD is the author. As many of you may remember, I am a huge E. Lockhart fan. I've heard Emily Jenkins/E. Lockhart (yes, same person) speak a couple of times, and she knows her stuff. She's a super-talented writer, a stylist and an amazing plotter. It will be interesting to see what she writes next! Now it's your turn! What have you been reading that you'd like to recommend? Tell me, tell me, tell me while I sip my tea!